I never planned to travel solo. Like most male boaters, I had dreams about being anchored out with that perfect woman in some secluded cove, sipping margaritas at sunset. When my long-term relationship came unglued, I found myself in a quandary. Do I sit at the dock waiting for a new relationship to evolve, or do I hit the proverbial road by myself? I couldn&apos;t picture my beautiful 48 Krogen tethered to a dock somewhere like a Travis McGee houseboat. I started boating when I was 12 years old. My dad rented a small runabout while we were on vacation in Lake George, New York, and as soon as we were out of visual range of the marina, he turned the controls over to me. The truth was that he felt uncomfortable operating a boat; after all, he had no experience. As a 12- year-old, I didn&apos;t know anything about needing experience. All I knew was that it felt very special to be at the wheel of a powerboat. After that day, I was the family boat captain and my dad was the owner/guest. The absence of a Coast Guard license or any other form of certification meant nothing in our household. To say that I operated by the seat of my pants would be an understatement.My family bought a small runabout shortly thereafter, and ever since I cannot recall a year during which we did not own a boat. In a never-ending progression that would make a yacht broker smile, we moved up the size ladder, ever onward and upward (nautical parlance for "larger"). At the time my dad passed on in 1994, I owned a 42-foot Post Sportfish. In all those years of boating, I don&apos;t think I was ever alone on a boat. In my younger days, it was weekends with the family, friends, and relatives. During those wonderful teenage years, I had an endless supply of buddies to handle the lines, and an occasional date if I was lucky. The years rolled on; I had my own family and a built-in crew. My kids grew up, went to college, and took jobs away from home. I got divorced, dated, and somehow always managed to have crew aboard. So here I am, the proud owner of a Krogen 48 North Sea, Henry&apos;s Journey, having just completed my first solo voyage from Sarasota, Florida, to Annapolis and back, a distance of 2,700 miles (but who&apos;s counting?). The decision to travel solo was not an easy one. We&apos;ve all read stories about transatlantic solo voyages that are both inspiring and intimidating. Traveling alone up the IntracoastalWaterway clearly is not in the same league as those open-ocean passages, but there are some similarities. Many instinctive factors militate against going it alone, even on the ICW. As humans, we are essentially social animals.We pair up, fall in love, and live happily ever after. (At least that&apos;s what the storybooks tell us.) Cruising solo along the ICW makes you the odd man out. Overwhelmingly, cruising is done by couples. Pull into a marina, and invariably someone at the potluck dinner will ask the inevitable question, "Where is your wife/girlfriend?" I always thought admission to such events was a dish of food, not a significant other. Besides, I make a wicked cheesecake. Fear drives the decision-making process. If you think about it long enough, you can let the "what if" trap stop you in your tracks before you leave the dock.What if I get sick or fall and get hurt?What if the weather is really foul? What if I can&apos;t dock this 48-foot beast by myself?What if I can&apos;t handle being alone day in and day out?What if I&apos;m a miserable cook? Let&apos;s start with the basics. 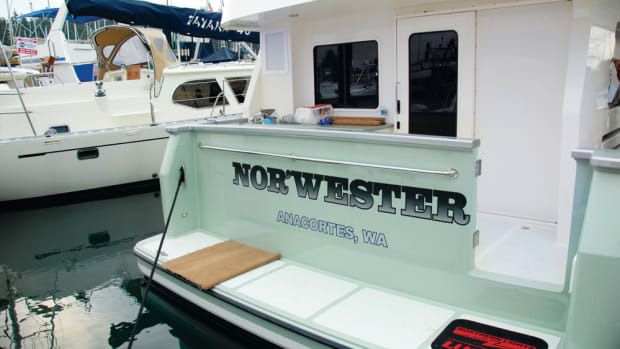 Singlehanding a 48-foot single-engine trawler, or any large boat for that matter, takes a lot of advanced planning. Spontaneity does not work well once you&apos;ve left the dock, simply because you have only one set of hands and it is very hard to multitask while under way in the often narrow ICW. You can always idle in neutral and coast for a while if necessary, but somehow human nature tells us to keep moving. You&apos;ll need to plan your route with your chart plotter or paper charts before you cast off, or you will find yourself involuntarily beached somewhere on a narrow, curvy stretch of the ICW, cell phone in hand, dialing TowBoatU.S. If you plan to stay at marinas, call for tentative reservations at least a day ahead. Have an alternative site selected in case you don&apos;t get quite as far as you planned. Take a yellow highlighter and mark chosen marina locations on your paper charts, and also write their phone numbers on the chart. Skipper Bob&apos;s two books Marinas Along the Intracoastal Waterway and Anchorages Along the Intracoastal Waterway are invaluable in this process. If you decide to anchor out, do your research locating an anchorage in advance and make sure you drop the hook well before it gets dark. Sitting up on the flybridge sipping a glass of red wine as the sun sinks slowly on the horizon is a wonderful, serene moment. Thrashing around on the bow in the pitch black of a moonless night while trying to get the hook down in an unfamiliar anchorage is neither wonderful nor serene. The difference between these two events is timing and planning. My Krogen 48 has a pilothouse berth, and when singlehanding, I usually slept up there while at anchor. The view through the pilothouse windows is spectacular, especially during a full moon, but the real reason I bunked up there was to ensure that I would hear the anchor alarm if it went off during the night. Using your windlass by yourself is not difficult, even if you don&apos;t have controls on the bridge. Practice a few times in your home location. Try it when the wind is blowing, or where there is current. Practice until it becomes second nature. Before I made my solo trip, I assumed that docking at marinas would be the hardest (and most embarrassing) task to undertake alone. I could tie up singlehanded at home on a windless day with a slack tide, but in less than ideal conditions, I felt I would have major problems getting the boat secured. I had read about the 8-foot tidal swings in Georgia and the swift currents that run through the area. I could close my eyes and visualize all kinds of docking disasters-with huge crowds standing by watching and laughing-if left to my own devices. The reality, however, was quite different. It&apos;s a simple fact of life that marinas operate to make money by providing various services to the boating community. When you book a transient dock space, the folks who work at the marina are usually more than willing to help you. Call in advance to reserve a space, and tell them you are singlehanding and that you will need help getting both into and out of the slip. Ask them if they can get someone experienced down to your space before your arrival to help you with the lines. Be humble, even if you&apos;re not. Tell them you don&apos;t have much experience and that you will really need assistance. Ask them how you will be expected to tie up (port, starboard, etc. ), and get ready in advance. When you leave in the morning, pull over somewhere quiet and set your docklines on both sides for later in the day. Put your fenders in the general area where you&apos;ll need them (don&apos;t hang them till just before arrival). Make sure someone will be on-site to help even if you&apos;ll be arriving late in the day. If they hesitate at all in their response, seek shelter somewhere else! In my entire trip up the ICW, the only problem I had was when I arrived after hours without clarifying this issue. I received help anyway from some friendly boat owners. Check your tides and currents to see what the situation will be like when you arrive. Make life easier for yourself: try to plan your arrival when the currents aren&apos;t running like the Grand Canyon. Provisioning for a solo cruise is not much different from provisioning for any other trip. I bought a "seal a meal" device, and I vacuum-sealed meal portions that would fit my needs. When I cooked on board, I tried to make enough for two or three meals-grilled chicken for dinner, followed by a cold chicken sandwich for lunch the next day, and perhaps chicken salad for the following lunch. In the morning before you get under way, prepare your food for the day: meals, snacks, and drinks. If you don&apos;t wish to stop, get a small cooler to keep in the pilothouse (or wherever you operate from). Leaving the boat on autopilot and stepping down to the galley for a few minutes is not something you want to be doing on the ICW. Many marinas (mostly north of St. Augustine) provide courtesy vehicles for transient boaters. I found this convenience to be extraordinarily helpful in keeping the boat provisioned. Having a bicycle on board can be a great help and also provides the opportunity for some needed exercise. My trawler is not designed for fishing, but my cruising speed of 8 knots gave me lots of opportunity to drag a few lines when the weather allowed me the luxury of going outside into the Atlantic. Fishing singlehanded is a little complicated in a big boat and is not for the faint of heart, but fresh fish usually is worth the effort. Putting together a spare parts inventory and tool kit was much easier than I had anticipated. Not being a mechanic, I chose to rely on the kindness and wisdom of others concerning tools and spares. I have the good fortune of knowing a great diesel mechanic in my hometown of Sarasota. Dickey Stem of Coastal Marine Power is the kind of mechanic most boaters dream about: pleasant, courteous, intelligent.We sat down together and made a list of tools and parts to keep on board. I bought them all, no questions asked.We spent two days in the engine room together, and I learned how to change filters, oil, and impellers. (I bought an impeller puller, among other things.) 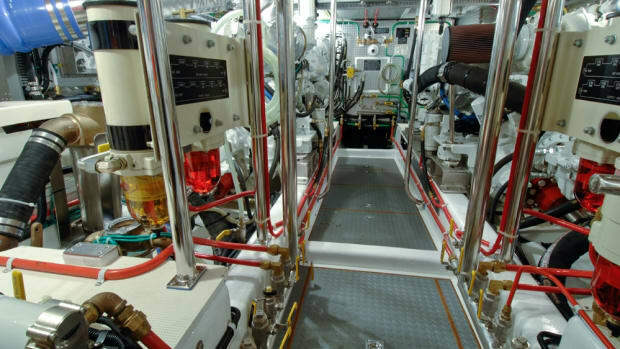 I&apos;m not going to delude myself into thinking that I&apos;m a mechanic, but my comfort level grows with each visit to that sacred space below decks. Having a good first aid kit is an obvious necessity. I found that most of the standard kits on the market needed to be supplemented. Somehow I managed to cut myself on a regular basis while cruising, and the extra Band-Aids, Neosporin, and peroxide I had stashed were helpful. If you take prescription medication, carry extra copies of the prescription with you. If you need refills, make sure you allow time for local pharmacies to order medications that might not be in stock. When traveling alone, you need to carefully consider your own personal fatigue levels. On the ICW you should be paying attention all the time. Many sections are quite narrow, and the opportunities to run on autopilot are few. This is noticeably different from openwater cruising, and it can be exhausting. Learn your threshold for fatigue, and make sure you get appropriate rest. I found I could comfortably run my boat for about six hours a day. This allowed me time in the morning and afternoon to complete routine maintenance, housekeeping, and planning. Occasionally I would take a day off from cruising and either explore with the dinghy or walk through the community near the marina. Keeping in touch with "the real world" while traveling the ICW is relatively simple. Cell phone service is excellent almost everywhere along the coast. With a laptop and wi-fi, you can stay in touch with friends, family, and the business world. I kept a daily blog of my travels, which you can read at travelswithhenrysjourney. blogspot.com. This allowed family and friends to share my experience, and the process of making daily entries and reflecting on the day&apos;s events left me feeling connected with those closest to me. In the end, after 2,700 miles and four months in "the ditch," you might wonder if this is a journey I would undertake again. The answer is an unequivocal maybe. If I am honest with myself, I recognize that I prefer the company of friends and family to going it alone; yet there are times when the memory of sitting by myself at anchor under a full moon on the Chesapeake brings a rather large smile to my face. While writing this article, I was in the process of planning a seven-month cruise that would take me from Sarasota to New York City and then around Nova Scotia via the St. Lawrence Seaway. This time, I invited company. I decided to send an email to friends and relatives, inviting them to jump on and off along the route and thereby provide me with crew (and company) during the 5,000 or so miles of the trip. The email described the trip and divided the journey into segments at least one week in duration, with one as long as 18 days. The legs were calculated based on the reasonable proximity of marinas to airports, car rental agencies, major cities, and so forth. Quite simply, it was an attempt to make it easy for friends to get on or off without having to jump overboard somewhere and swim for shore. I expected a few "maybes." In fact, the response was so overwhelming, I had to create a waiting list for some parts of the trip. But inviting crew to hop on and off creates its own set of issues. The logistics of where and when to schedule crew changes requires considerable planning and has to factor in downtime for bad weather, mechanical breakdowns, and the like. Planning a calendar of this nature is somewhat akin to playing dominos-a disruption potentially affects everyone down the line. Without sufficient "wiggle room," logistical problems will be endless. I&apos;ve attempted to reduce the potential for a catastrophic calendar crash by breaking the trip into thirds and leaving two weeks between each segment. In this way, I hope to avoid or at least minimize the impact of an event, mechanical or otherwise, that might affect the schedule. If things go as planned, this itinerary will result in two rest periods between segments of the trip, providing me the chance to simply catch my breath. 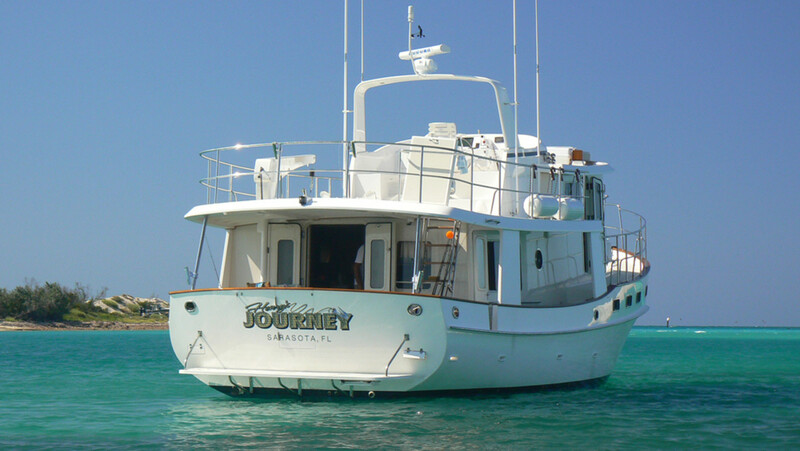 The difference between a solo voyage and a journey with friends and family is enormous. On a solo trip, you answer only to yourself. By the same token, you live with your decisions without any feedback from fellow human beings. Sleep in for a few days, or get up before daybreak and run to the next destination. Eat canned tuna seven days a week and no one will care.With friends aboard, all that changes. You have your itinerary to live or die by. The eggs you cook in the morning may not be to their liking. In close quarters, eternal friendships can wither and die a painful death. Expectations between friends need to be clarified well in advance. If people are cruising for the first time, there is obviously a lot to learn. If they expect cruise-line treatment, they need to change their reservations to the QE2. On Henry&apos;s Journey, everyone pitches in, or they walk the plank. After running a boat for a full day, the last thing I want to do is start preparing a meal for friends. Having someone aboard who will take the initiative in the galley is greatly appreciated. In the end, it will be an interesting exercise to compare both trips, weighing the pros and cons of each. Time will tell.